Oil paintings when kept in the dark tend to darken in colour. Its not the pigments, its the oil. Even the bleached Linseed oil will darken a little. So when the sun shines I take the paintings out of their dark storage and give them an hour to soak up the rays. What a noticeable difference it makes. I think it also helps a bit with the drying process, which apparently, can take years. 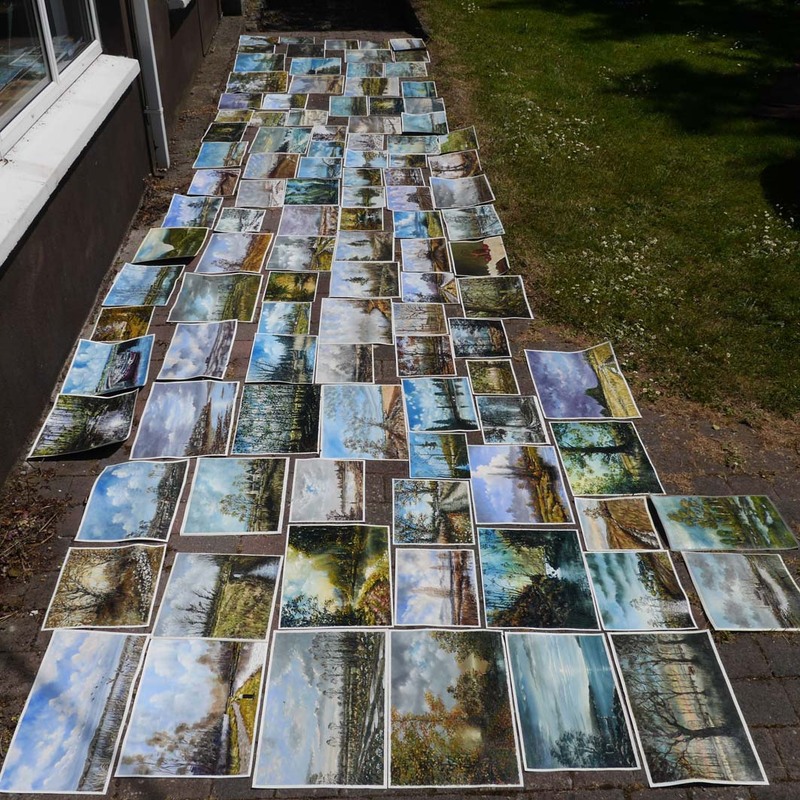 This batch of paintings, some of them 2 years old, when exposed to the light reeked of fresh Linseed Oil. A sure sign that there is still some un-oxidised oil present and a reminder of the advice of allowing a year to elapse before final or permanent varnish. I wonder does anyone take this advice seriously. I agree this is the correct procedure for the hard final picture varnish. I prefer to apply a temporary varnish at 6 months and frame under glass. The option is there to apply a final varnish at some point in the future when the painting is a few years old. This long drying time really necessitates using some form of accelerated drying agent in the painting. I have switched to using Alkyd paints and sometimes the painting is almost touch dry after a few hours. This paint is based on a resin similar to Liquin, a medium for standard oil paints. Just remember not to apply this as a varnish or for ‘oiling out’ as it seals and retards the drying of all that lies below it. 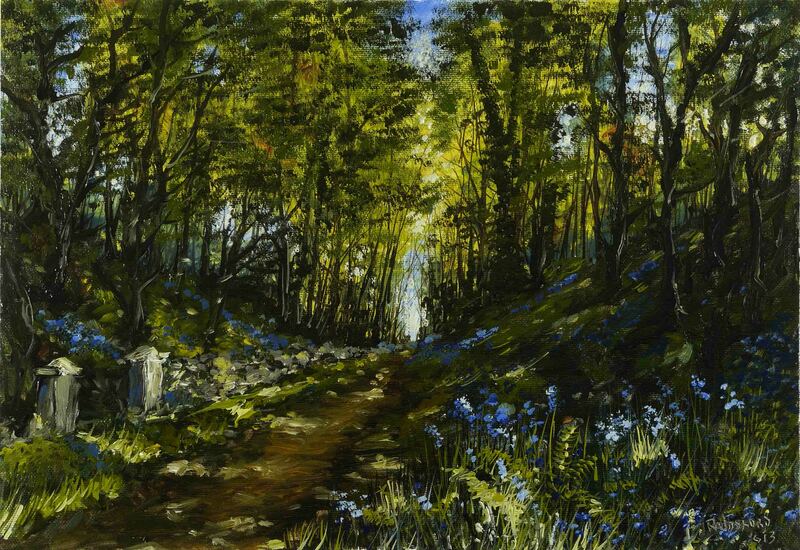 This entry was posted in Oil Painting and tagged Art, Bluebells, Culture, Irish landscape, Oil Painting, painting, Time lapse painting, Woods. Bookmark the permalink. Love the pop of blue flowers in the sunlight. Nice entry for the viewer. WOW!!! It is amazing to see them all lined up in the sun like a beautiful collection of windows into the natural world! Thank you Alissa. Its good to get a long term perspective when they are viewed in a bunch like this. A bit like postcards from different places I’ve visited in terms of working methods. I must admit, I’ve never used varnish on my paintings. Do you do this for protection or for appearance – or both, perhaps?! Thank you Marion. After ‘oiling out’ the surface is always glossy. This is an essential process to complete the paint film. Varnish can then be used to reduce gloss or increase it. So the final appearance is altered by varnish. On unglazed paintings varnish is very important to protect the surface as well. I have cleaned paintings I did in the 1970’s. The amount of dirt a painting can collect in 40 years is really astonishing and the cleaning is a tedious job. Even after this length of time the paint can be lifted if care is not exercised. I now always frame under glass using a ‘satin’ temporary varnish, usually because the paintings are not old enough for a permanent varnish. Thanks for that explanation, Liam. There must be a lot of dirty paintings of mine about that I’ve done over the years! Actually I believe this is the correct procedure to clean a painting, with soapy water. Its also advised not to let the paint layer get too wet as this might loosed the water based glue size under the primer. But I don’t think this would have such an effect on the modern acrylic size. Luckily you didn’t have to remove the varnish – now that’s a different matter entirely.